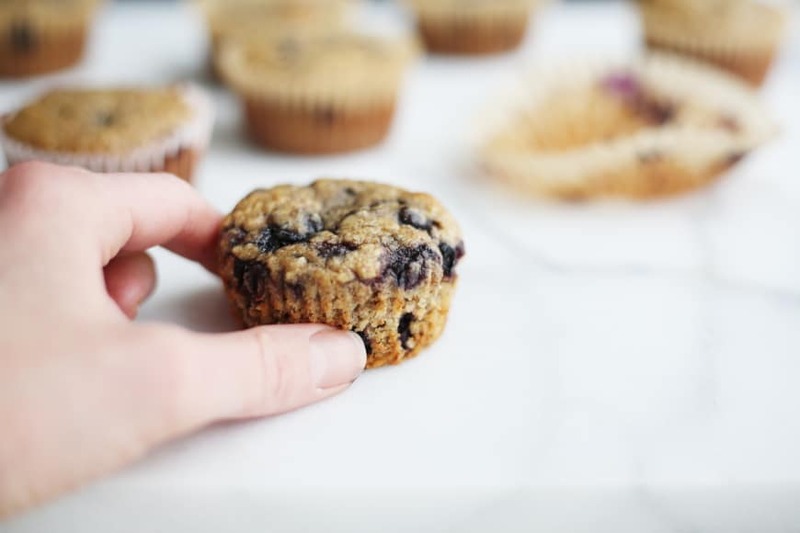 These nutritious blueberry muffins are made with whole oats and almonds, and are naturally sweetened with a banana and a touch of maple syrup. Best of all, the batter gets whipped up in minutes, right in the blender. This past year I’ve become hooked on making batters in my food processor and blender. While writing my cookbook, I discovered that I could streamline some of my favorite muffin and quick bread recipes by using my food processor, cutting back on prep time and clean up (another fist pump!). I even make my Grandma’s banana bread in the food processor (the recipe is in the book—hint, hint). Then I developed a recipe for banana oat pancakes that are made in the blender, which I teach in my Craftsy class. There are no bowls you wash, and you pour the batter straight from the container into the skillet, meaning no mess. Using the food processor or blender is not only a time saver, but it also allows you to make your own flours from whole grains and nuts. This is a huge money saver, costing pennies on the dollar verses bagged oat and nut flours. It also results in a much fresher flavor and has a better nutritional value (who knows how long those bags have been sitting on the supermarket shelves?). In this recipe I blend whole oats and sliced almonds with a touch of cinnamon and nutmeg until finely ground (I use a blender, but a food processor would work as well). 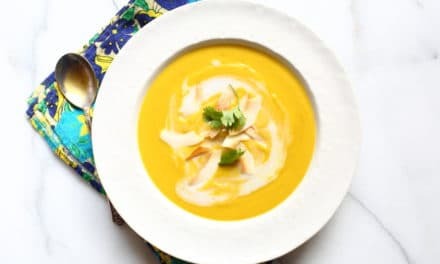 The blender does double duty by also mixing together the wet ingredients, including a whole banana for sweetness, until smooth. 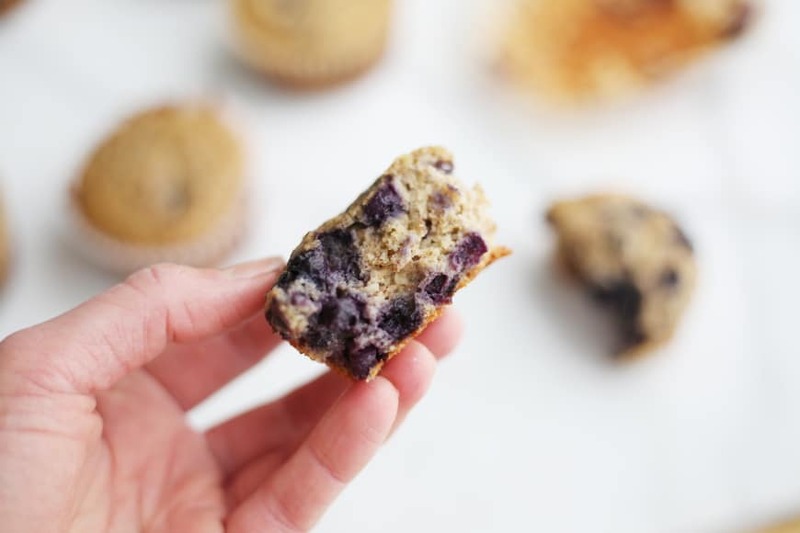 The result is a tender, lightly sweet blueberry muffin that’s filled with fiber, protein and good-for-you-fats (if you care about such things—my kids just like how they taste!). I store the muffins in a large ziptop bag in the freezer, which I have to hide lest James finds and eats them all before the week’s end. 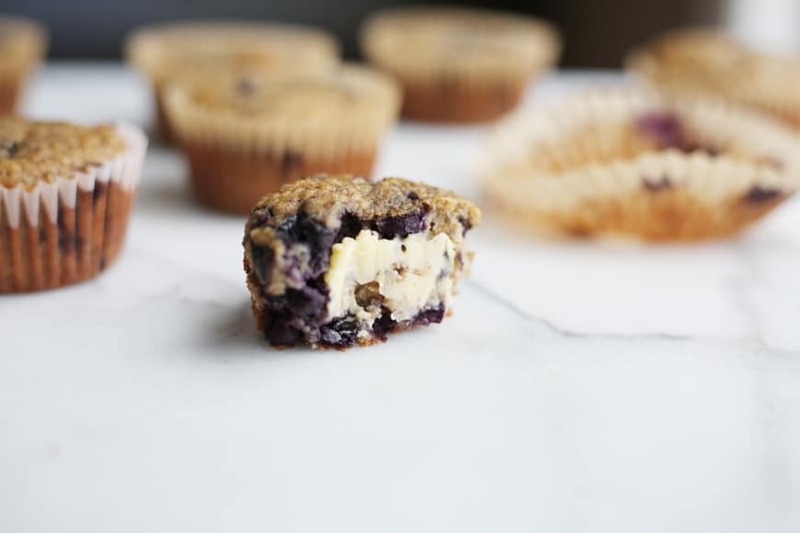 With Mother’s Day approaching, I highly suggest you make a batch of these blueberry muffins for one of the moms you know. Explain that they’re not actually for her to eat (although trust me, she will want to), but rather for her kids’ lunchboxes. If she’s anything like me, she’ll love you forever. 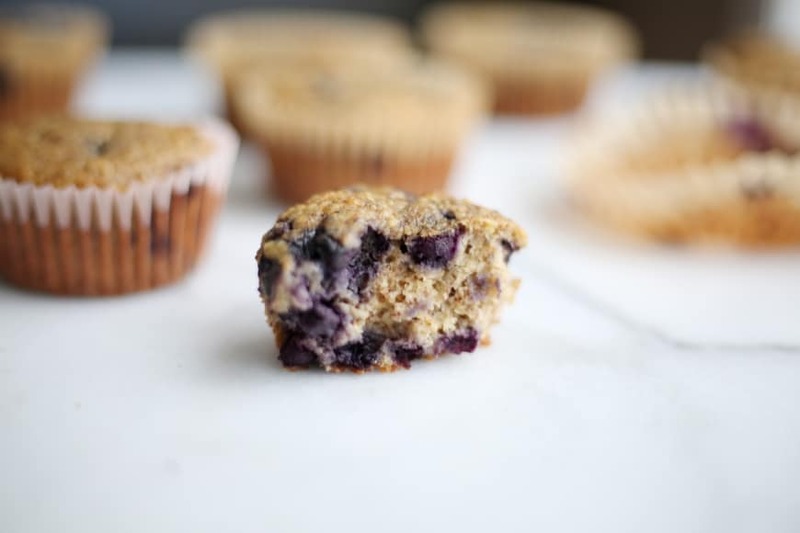 These tender, lightly sweet and nutritious blueberry muffins are a favorite in my household. I like to make a batch on the weekend and store them in the freezer to use in school lunchboxes and as snacks. A blender does quick work of breaking down whole oats and sliced almonds into flour, and it’s also used to blend together the wet ingredients, including a whole banana. 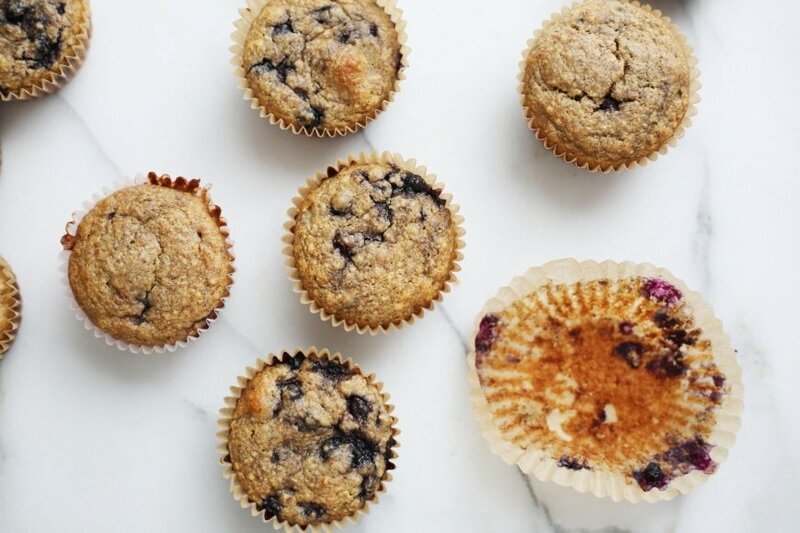 You could also make these muffins in a food processor. Preheat the oven to 350˚F. Line 12 muffin cups with paper liners. In a blender, combine the oats, almonds, flax seeds, baking powder, cinnamon, nutmeg and sea salt. 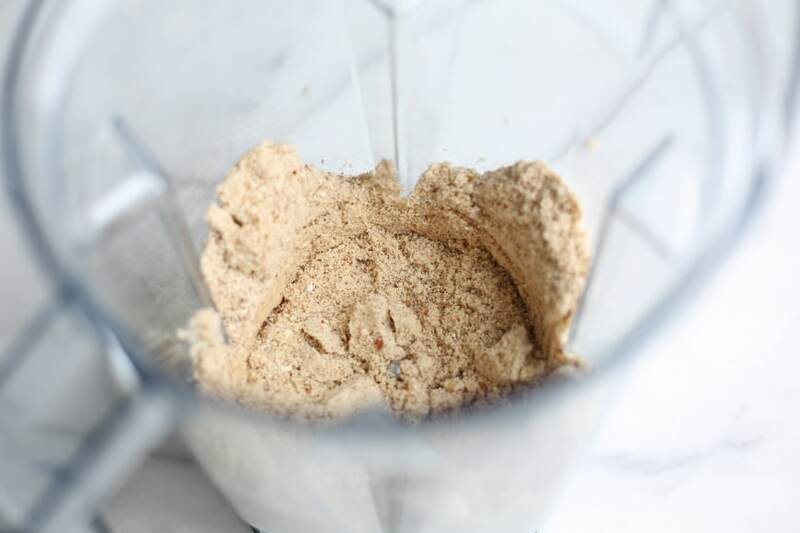 Blend until the oats and almonds are finely ground, stopping and scraping often if using a regular blender, or using the tamper to stir if using a high-speed blender such as a Vitamix. Be careful not to over-blend, otherwise the almonds could turn into butter. Transfer the flour to a medium bowl. In the blender (no need to clean) add the milk, banana, vanilla, maple syrup, coconut oil and eggs. Blend until smooth. Pour the wet ingredients over the dry ingredients and stir until combined. Fold in the blueberries. 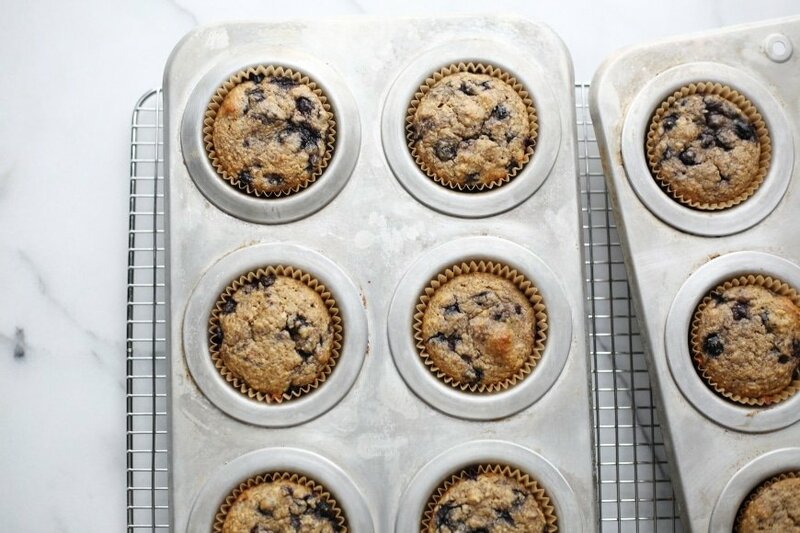 Transfer the batter to the prepared muffin cups (an ice cream scoop is a great tool for this job). 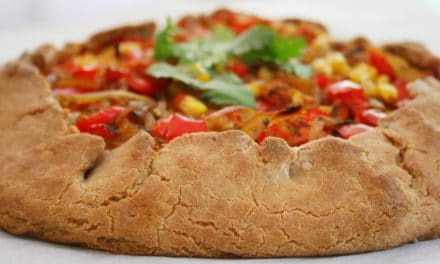 Bake 30-35 minutes, rotating the pan halfway through cooking, or until pale golden and lightly firm to the touch. Cool completely. Do Ahead: The muffins can be refrigerated in an airtight container for up to 2 days or frozen for up to 2 months. PreviousShakshuka (Tomato Egg Bake) plus GIVEAWAY! 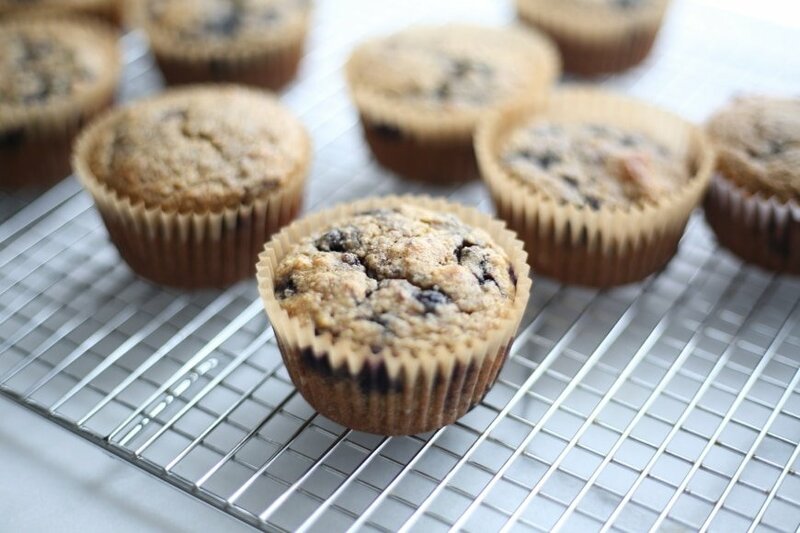 These muffins sound great and so easy. I have a question though, did you use the Vitamix dry container to blend the nuts and grains into flour? I only have the Vitamix wet containers and I’m concerned about scratching them. 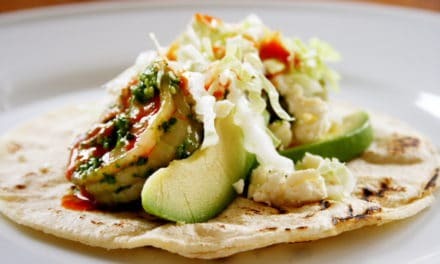 Would I get the same results in the food processor? Hi, yes I did use the Vitamix for these. Any good blender should work, or a food processor. I hope you enjoy!! I am excited to try these out. 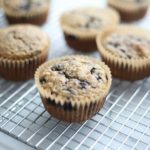 My guys LOVE blueberry muffins and throwing a batch or two (or THREE!!) into the freezer and/or divying them up amongst mom friends sounds grand. 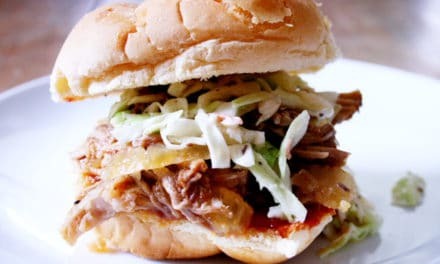 Plus, its sounds like a great baseball-game-is-running-late-need-a-healthy-snack-before-dinner fix! I’ll let you know how mine come out!! I hope you’re boys like them! Keep me posted!